Southwest of Malé, in the South Ari Atoll, approx. 30 minutes by seaplane from the airport and close to sister island Athuruga. 73 rooms in total. The 47 cottage-style Beach Bungalows are scattered around the island just yards from the water's edge. Each has air-conditioning, ceiling fan, sitting area, telephone, iPod docking station, minibar, tea and coffee making facilities and open-air bathrooms. The Gardenview Room is on the lower level of a two-storey building in the island's interior. The 25 stunning Water Villas have a private large terrace with direct access to the water, sunbeds and dining area, plus minibar, Wi-Fi and iMac with large selection of international movies and music. Water Villa guests also enjoy exclusive dining available in the à la carte overwater restaurant. A small picturesque all inclusive resort with a delightful Maldivian landscape encompassing a popular beach bar, open-air restaurant, bar and boutique, plus a stunning overwater restaurant and bar exclusively for water villa guests. There is also a Serena Spa, PADI dive school and a watersports centre where waterskiing, snorkelling trips, deep sea fishing and bottom fishing can be arranged (extra cost). IDIVE PADI dive centre onsite. • Access to Maldivian Air Taxi seaplane lounge. A naturally simple, wonderfully relaxed and informal resort perfect for diving, watersports and sun worship. 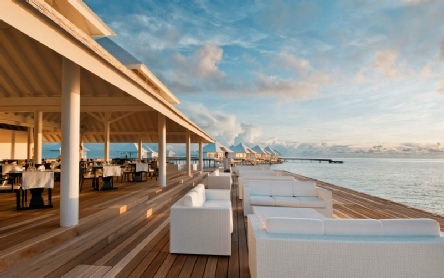 The resort also boasts excellent dining and a fabulous addition of 25 water villas. The Diamond Thudhufushi is a great All Inclusive option with stunning beaches and a PADI dive school. 2019 package holidays to the Diamonds Thudufushi Maldives Prices are per person based on two sharing.